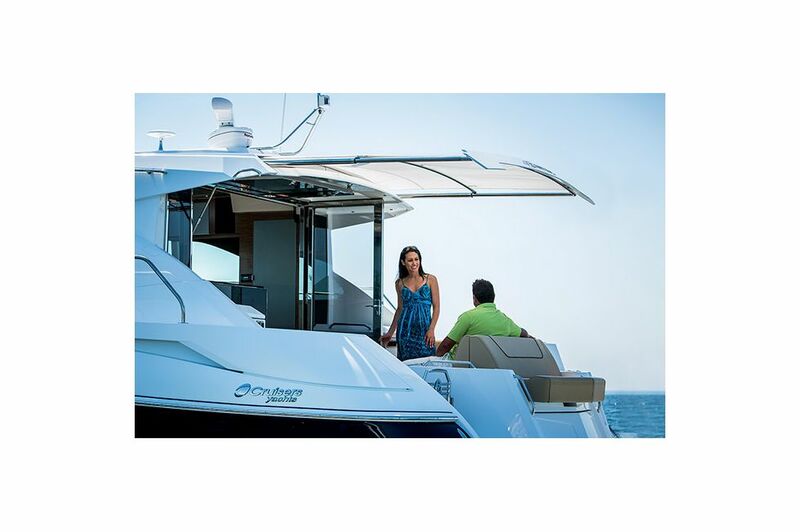 Aboard the 45 Cantius, the spacious and integrated cockpit features wrap-around seating that converts to a plush sun lounge with fore/aft bolsters. A perfect blend of luxurious and organic comfort is brought to you by the Amtico flooring with the amenities needed to entertain with ease. 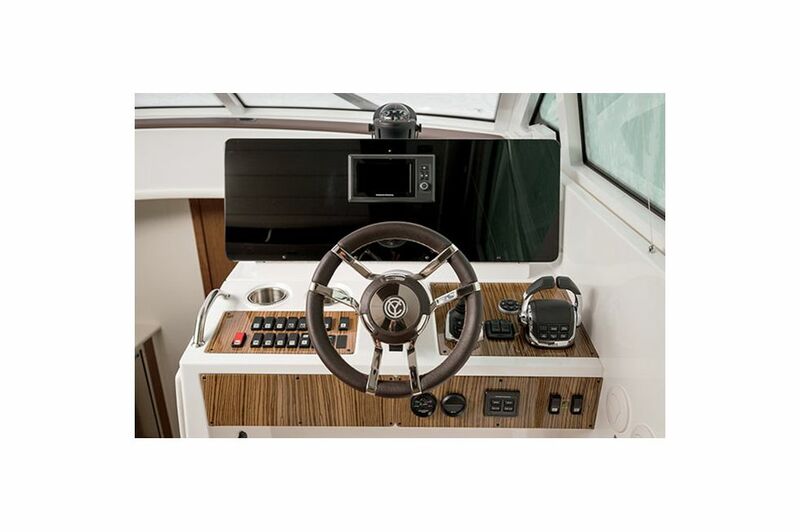 Cruisers Yachts deliberately engineered the cockpit of the 45 Cantius to have two removable cockpit tables, an ice chest on the starboard side, and a hot/cold cockpit shower giving you the amenities needed for a remarkable time on the water. Available cockpit options include a grill, refrigerator, and stools if you're interested in a custom experience aboard the 45 Cantius. 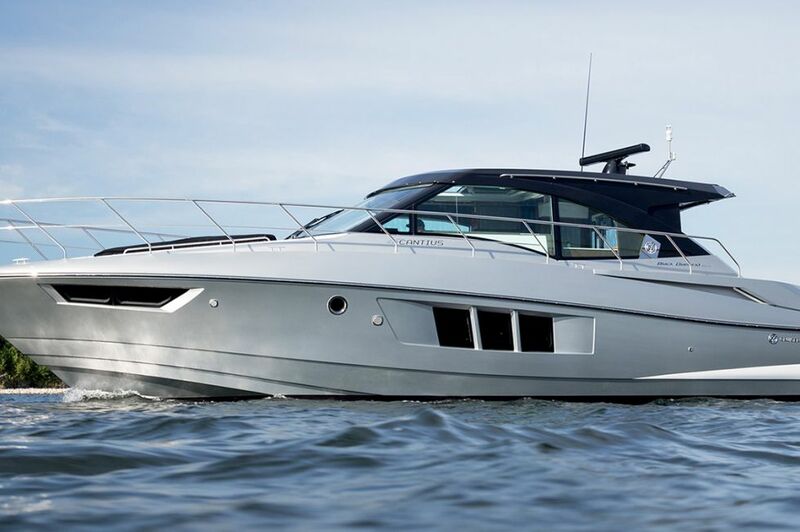 The revolutionary design of Cruisers Yachts 45 Cantius continues through to advance technology of the helm giving you complete control from start to finish. 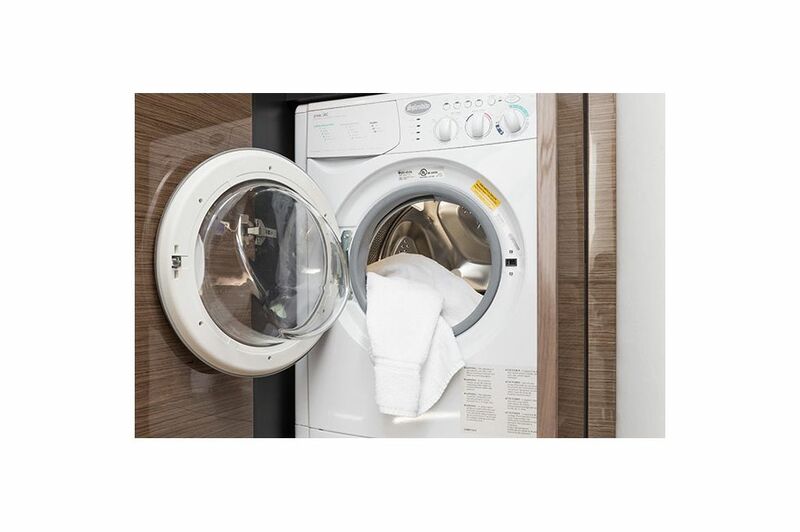 Careful thought and engineering delivers easy reach of the buttons and switches needed for a comfortable ride. Command the twin Volvo Diesel engines of your 45 Cantius with the convenience as a fly-by-wire and Joystick IPS. Couple the ease of command with the 40,000 BTU air conditioner/heater for all-season comfort and you'll know comfort. Rounding off the 45 Cantius helm design is a double seat with fore-to-aft adjustment and a stereo remote for endless leisure on the water. 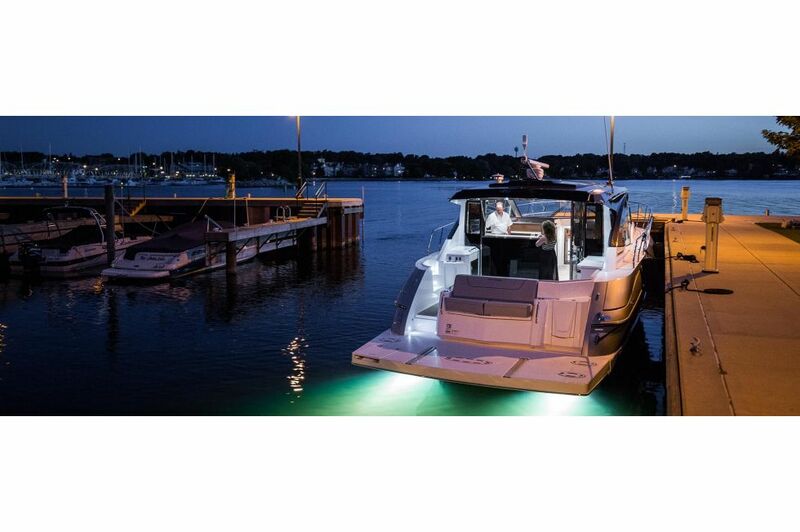 This innovative piece of the 45 Cantius is strikingly well-designed and gives you just the power to create a sun filled cockpit lounge or a comfortably shaded space for your guests. 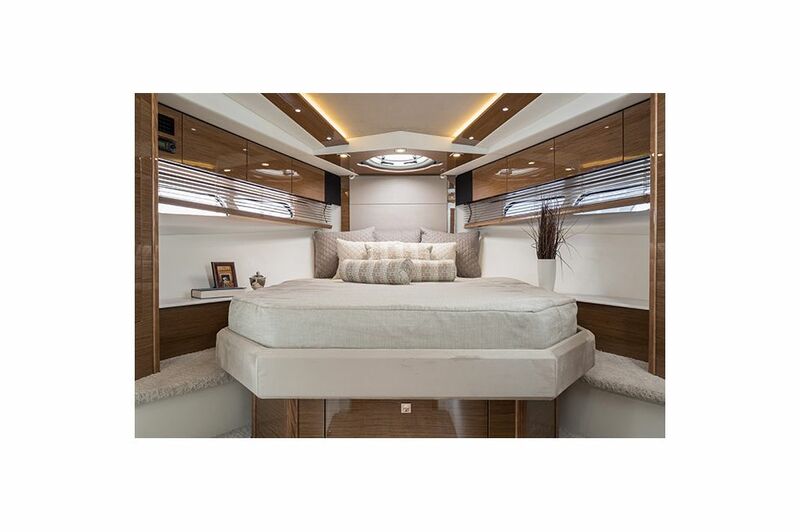 With merely the push of a button, the fashion-forward shade automatically extends 6' from the hardtop to provide cover for the entire cockpit lounge space. 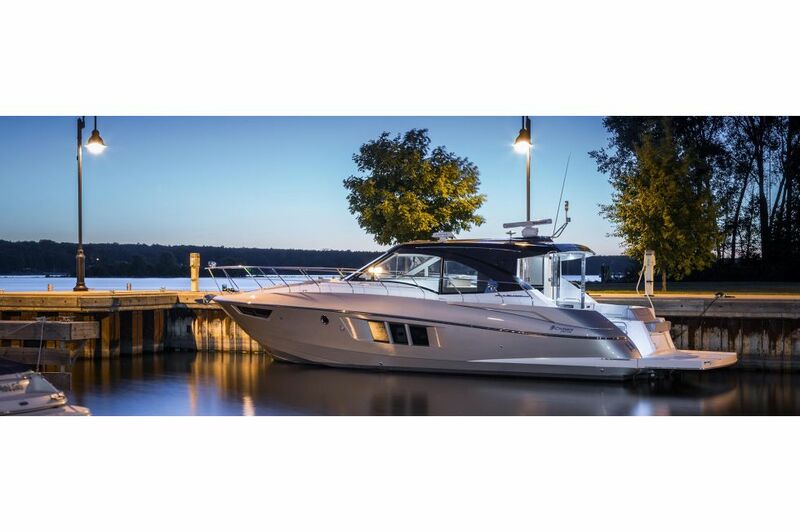 Cruise in style, your way, aboard the 45 Cantius and when you're ready for it, it can be utilized while entertaining at the dock or cruising to your favorite spot, and virtually disappears back into the hardtop when not in use. The sun is the center of the universe, and the 45's captivating upper salon will be the center of yours. Cruisers Yachts designed the 45 Cantius with large windows at every vantage point and an epic retractable sunroof so you can have the experience the warmth of a beautiful day effortlessly. 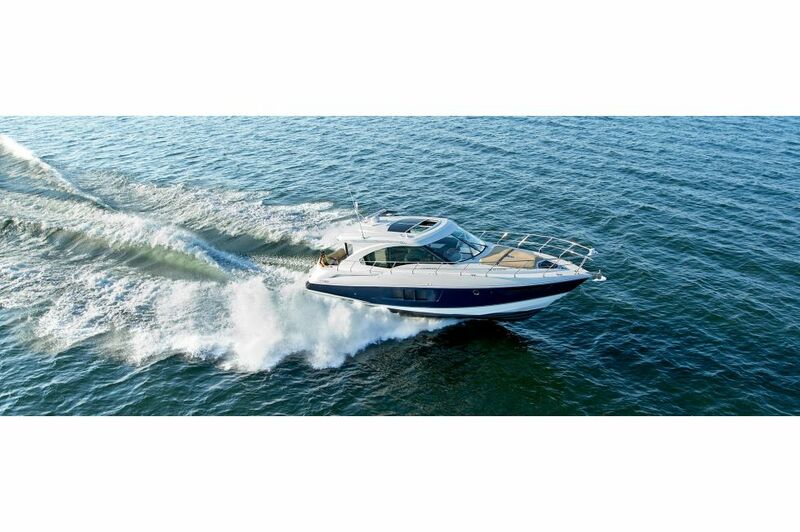 The open-concept design of this Cruisers Yachts model provides easy access to the helm, galley and dinette seating. 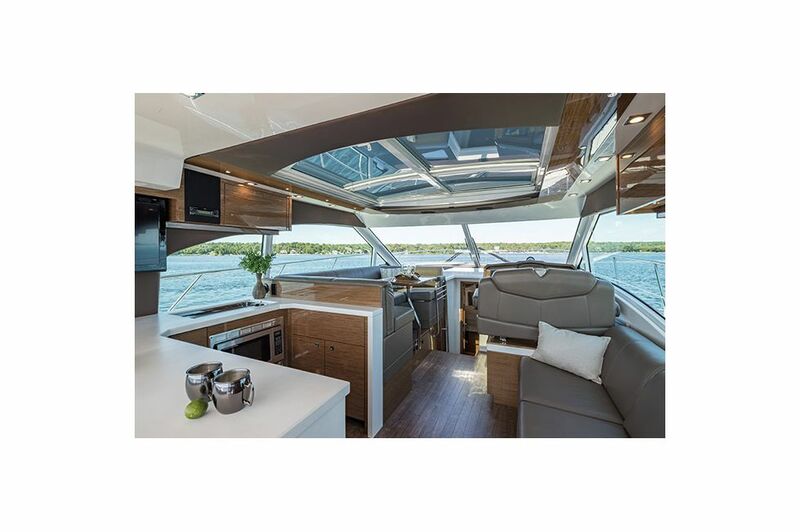 The conversation will flow easily amongst friends and family along the immense 144" opening from the swing up stainless steel rear salon window and the large swinging stainless steel cabin door. 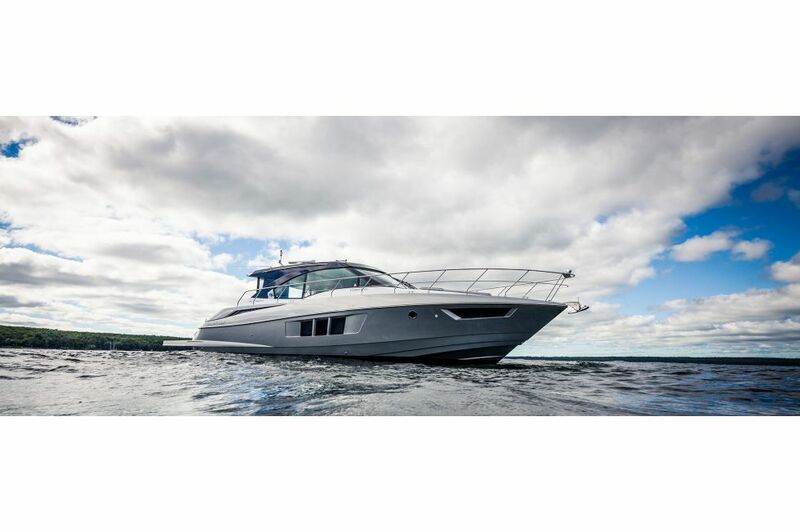 The 45 Cantius yacht delivers a brilliantly integrated galley host to a convenient and well-built island which separates the space from the cockpit. The clean lines of the galley and open air design makes conversations longer and entertaining easy. 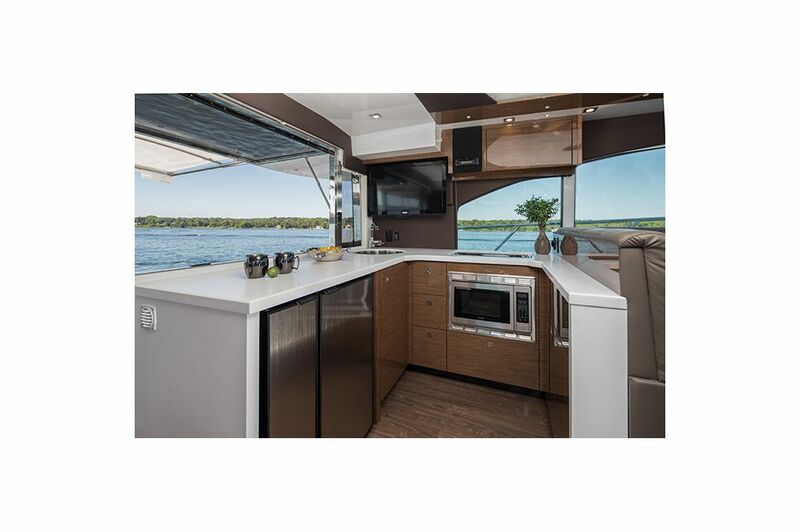 With ample storage in the 45 Cantius galley, a two-burner electric stove, microwave/convection oven, refrigerator/freezer, sink with spray faucet and a 32" flat screen TV, you'll never want to find shore again. The Cruisers Yachts 45 Cantius beckons like an invitation, and effortlessly welcomes all your friends and family aboard. Perfect for entertaining, the large built-in liquor cabinet keeps all your bottles accessible and secure. The beautifully built 45 Cantius master stateroom provides a comfortable, luxurious private space for you to retreat. The master stateroom features a comfortable queen berth, cedar-lined closets, an iPod port with remote, and the convenience of a well-appointed private head. 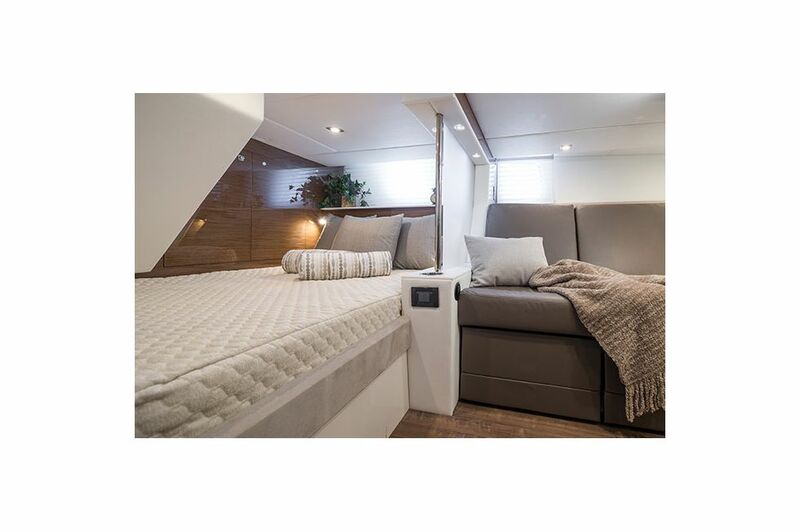 You'll love having a space to call your own aboard the playful and exquisitely. 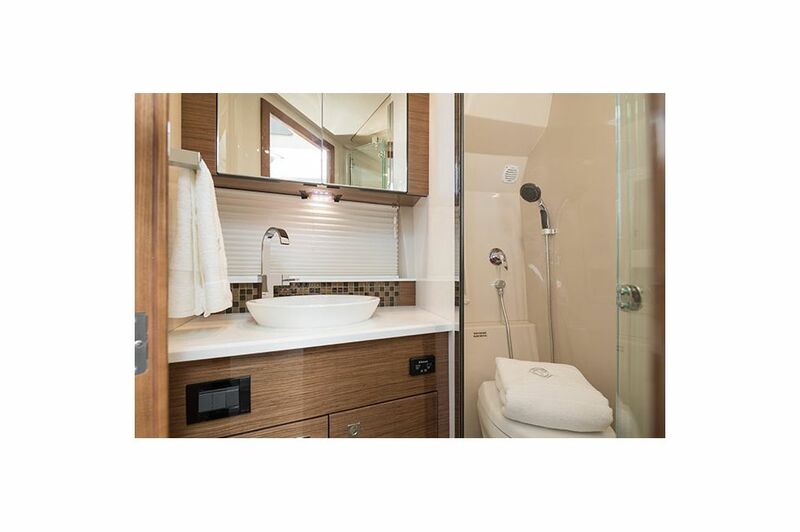 Guests aboard your 45 Cantius will have a separate, private bathroom offering a spacious 6'4" headroom in the shower stall and a contemporary vanity comprised of solid-surface countertops. 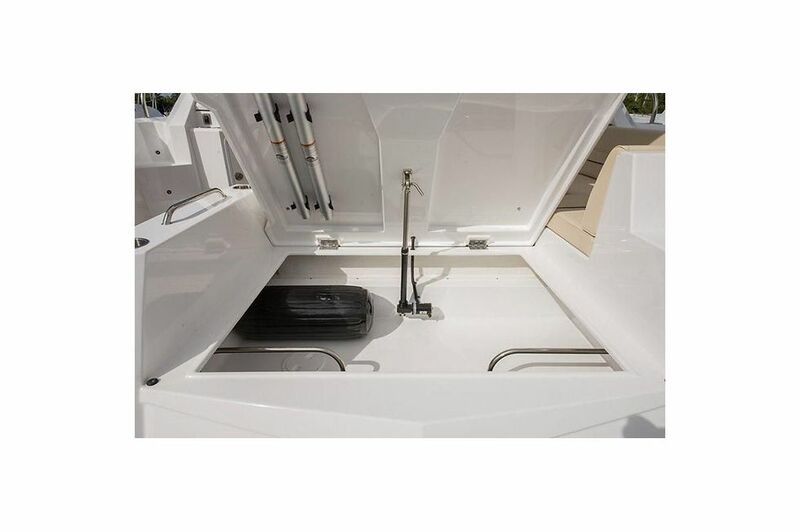 Finishing off the midship head is convenient storage above and below the vanity giving you truly livable space. No detail was overlooked in the 45 Cantius by Cruisers Yachts and you'll find that true all the way to the amenities of the master head. The bathroom features timeless tiling accents and euro-style fixtures making the space feel lush and elegant. 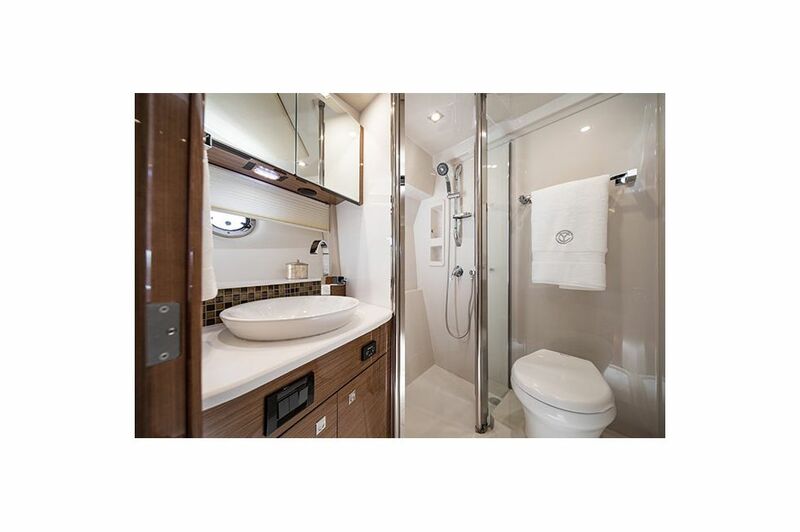 You'll never feel cramped with 6'4" headroom in the shower, a separate head and vanity providing the comforts of home. 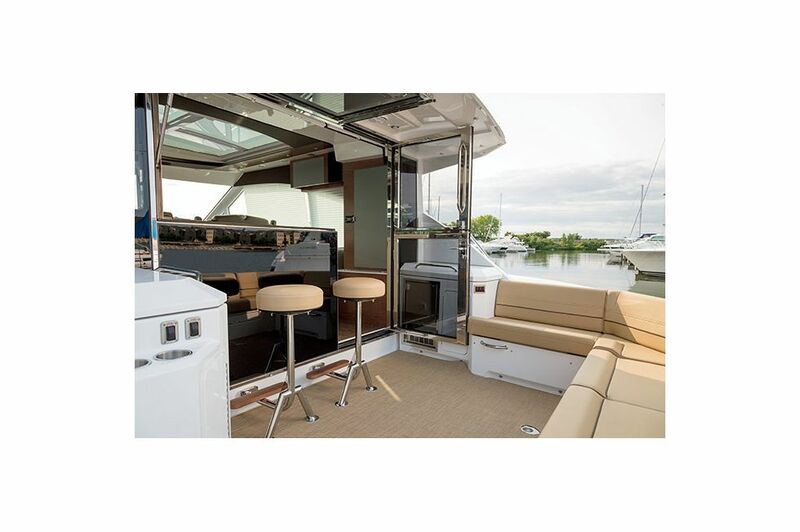 Grab a few chairs, some drinks and good friends to make the most of the aft deck of the 45 Cantius. 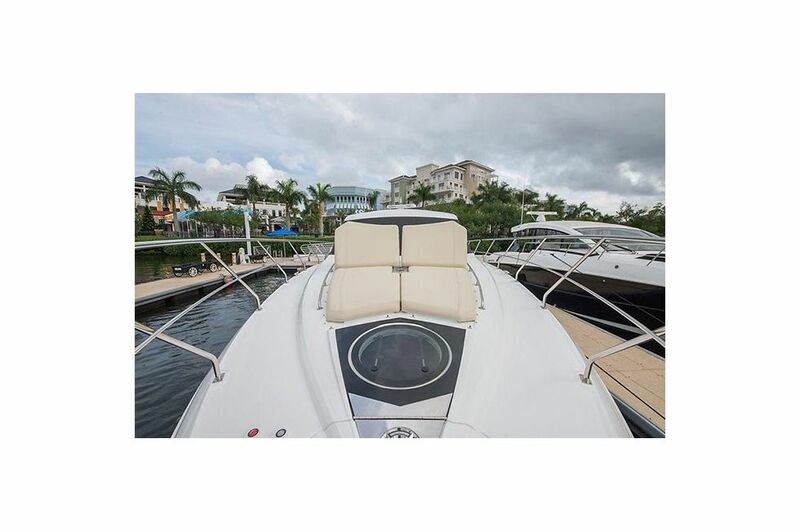 You'll love the spaciousness of the deck as you watch the sun go down, watch the kids play or love the easy access to this large and in-charge yacht.